$1600 Instant Savings. Expires May 16, 2019. * All prices reflect savings. 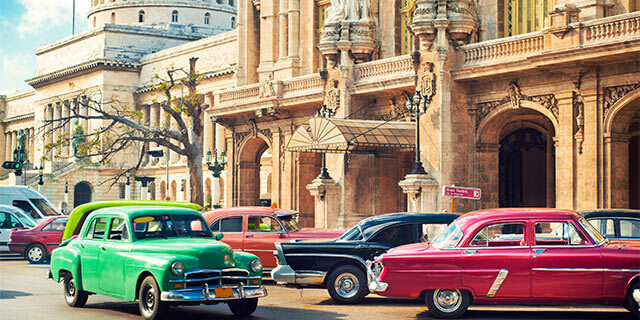 You’ll truly be captivated and delighted by all the aspects of Cuba you’ll discover on this engaging and comprehensive tour covering a large swath of the island. From the picturesque Spanish Colonial towns of Sancti Spiritus, Santa Clara and Trinidad to one of the best beaches in Cuba, Varadero, to the bustling city of Havana, Cuba's political and cultural center, you’ll meet and interact with Cubans, where they work, live and play. You'll discover why the world loves Cuban music, meet some of the best up-and-coming artists on the island, and enjoy meals at local paladars where young entrepreneurs are taking advantage of relaxing laws to build private business in Cuba. Instant Savings: Get $1600 off if you book by May 16, 2019! 1. For some flights, baggage fees must be paid at airport for each flight segment: $25 for 1st checked bag / $40 for 2nd checked bag. 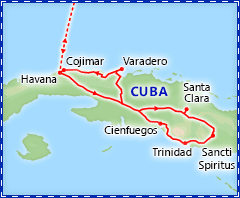 Accommodations: 2 nights Hotel Plaza, Hotel del Rijo or Hotel Don Florencio, Sancti Spiritus. Included meals: Dinner. Full Day Itinerary: Today, board your non-stop flight bound for Cuba at Miami International Airport. Full Day Itinerary: After breakfast, drive to Hacienda de Manaca Iznaga, located 20-25 minutes from Trinidad, in the heart of the Valley de los Ingenios, a series of valleys once known as a Cuba's center for sugar production. Accommodations: 2 nights Melia Varadero. Included meals: Breakfast, lunch & dinner. Full Day Itinerary: After breakfast this morning, depart from Sancti Spiritus and visit the town of Santa Clara. Then, continue on to the beautiful Varadero beach, the most famous beach on the Cuban mainland, and check into your hotel. NOTE: The Che Guevara Mausoleum is closed until further notice due to maintenance. Full Day Itinerary: After breakfast at the hotel this morning, we'll depart for a visit to the Danzón's Club in Varadero. Danzón is the official national dance and musical genre of Cuba. It originated in Matanzas and is practiced by hundreds of Cubans throughout the country. The clubs of "danzoneros" are dedicated to preserving the tradition and history of this dance. While visiting the Danzón's Club you'll have the opportunity to talk with its members (mostly elderly) about the history and characteristics of this dance. Of course, you'll also have the distinct pleasure of joining the members while they dance to this traditional and lilting rhythm. Accommodations: 3 nights Melia Cohiba, Havana. Included meals: Breakfast & lunch. Full Day Itinerary: After breakfast, check out of our hotel in Varadero and drive to the district of Alamar on the outskirts of Havana. Started as an expansive social housing project in the 1970's, these Soviet-style pre-fabricated concrete apartment blocks are now home to hundreds of thousands of Cubans. Among the buildings in Alamar are community gardens, called "Organopónicos," where residents grow fruit, vegetables and herbs for their own consumption and local sale. Similar to co-op and community gardens in the United States, these Organopónicos facilitate community development and offer Alamar's residents access to fresh produce. Enjoy a visit to one of these Organopónicos, which few visitors to Cuba have the opportunity to do. 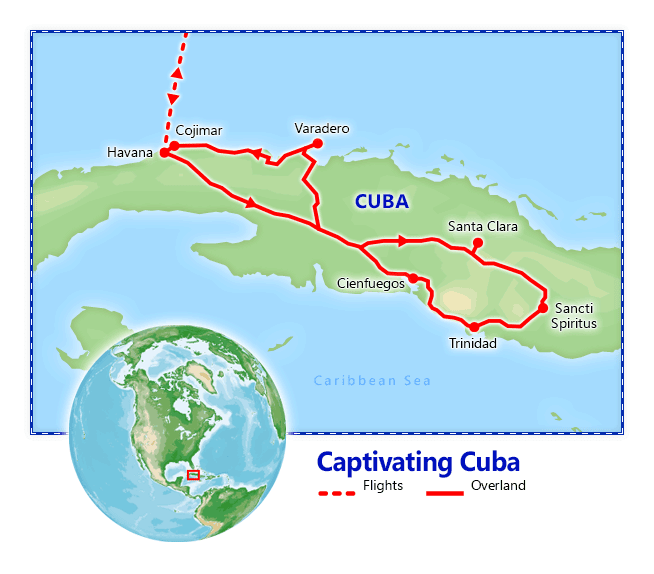 Then, drive to Hemingway's Cuba retreat. There are many historical and cultural ties between Cuba and the United States, and one of the best known is the legacy of Ernest Hemingway, who lived more than 20 years in Cuba, from 1939 to 1960. You'll visit Hemingway's beautiful mansion, Finca Vigía, (literally meaning "lookout farm"), now a museum. While visitors cannot enter the house itself, the large, open windows and doors around the entire property allow plenty of unobstructed views of his preserved 9,000 book library, as well as his animal trophies and famous fishing boat, Pilar. Proceed to Havana and check into your hotel. Full Day Itinerary: After breakfast this morning visit one of Havana's famous cigar factories where you will see hundreds of workers rolling Cuban cigars by hand. If the cigar factories are closed, a private cigar demonstration will be provided instead. Full Day Itinerary: After breakfast this morning, stop at the Plaza de la Revolución, the most famous and politically important square in Cuba and fine example of the modern movement of architecture in the 1950’s. The square has witnessed many rallies and revolutions that have altered the course of Cuban history, where you'll view the 109-m tall tower and an 18-m statue of José Martí. On the edge of Old Havana, experience the Cuban collection at the Fine Arts Museum. Here you can appreciate the evolution of the country's history through the work of its most famous artists. Full Day Itinerary: Today, bid farewell to Cuba as you transfer to Havana's Jose Marti International Airport and check-in for your flight back to Miami. ¡Adiós, Cuba! Note: Itinerary is subject to change based on local availability.